Before I launch this rickety rowboat of review into the vast oceans of David Mitchell’s newest novel, I’d first like to call-in at the ever bustling port of public opinion. Why didn’t The Thousand Autumns of Jacob de Zoet make it to this year’s Booker Prize shortlist? Surely the judges don’t believe that it fails to contain the “rich variety of styles and themes” that is the prize’s ostensible qualifying mandate? When the judges are asked (and asked they have been) why this novel was over-looked, their answers ring more of defensive self-preservation than reasoned literary criticism. For the fans of David Mitchell are sharp-tongued and ferocious loyalists, who seem to view any slant against him as a slant against themselves, against good-taste and even (such is their voracious love for his books), against reason itself. The internet is abuzz with venomous diatribes lambasting the Booker judges; David Mitchell’s non-nomination has produced more media interest and column inches than all the shortlisted novels combined. If protests, petitions and picket lines were the stuff of literary complaint, the offices of the Man Group would be surrounded by an erudite mob of Mitchellites, baying for blood. Alas, the dissent of the literati is currently expressed in polite letters to the editor, mild-mannered blog posts and quiet coffee-shop concord. Maybe it’s time for readers to react. Maybe it’s time for book lovers to get militant. But let’s not lose perspective. Much of the angry out-pouring surrounding his fifth failure to win the Booker Prize appears to stem from a consensus that, somehow, David Mitchell is ‘due’. After all, Cloud Atlas, Ghostwritten and Numer9dream didn’t win, so The Thousand Autumns of Jacob de Zoet has to, right? That Number9dream lost out to The True History of the Kelly Gang may be one of the most heinous oversights of modern literature; but 2001 was a duff year – Atonement didn’t win anything either. If the Booker Prize was an award of accumulative quality, then David Mitchell would be the most deserving writer never to have won. But the hard-boiled fact of that matter is this: you don’t win the Booker for a body of work, but for one novel; distinct and separate; in isolation from all previous efforts. There’s a kind of Gamblers’ Fallacy that blinds the fans of David Mitchell, as if the more he loses out on the prize, the more likely and deserving he is to win it next time. As brilliantly expressive a work of fiction as Number9dream is, its achievements bare no relation to this year’s prize. It’d be wrong of the Booker judges to give the award to a less-deserving novel, by way of apology for a previous oversight. So, with this in mind, we must be deaf to the silent cacophony of internet dissent. We must block out all of the misguided reasoning which argues that, because Cloud Atlas didn’t win the Booker prize, then The Thousand Autumns… should. Let’s examine the book for its own merits and forget, for now, the many crimes of neglect perpetrated against David Mitchell’s previous novels. The Thousand Autumns of Jacob de Zoet is a bit like Jesus; immaculately conceived, but sloppily executed. It’s historical fiction of the densest oeuvre; apparently Mitchell spent six months in residency at the NIAS in Holland, merely to conduct ‘preliminary research’. Every sentence pours with historical detail, linguistic notes and precise dates; it’s impressive, but sometimes there’s more detail here than is necessary or enlightening; like a long-soaked sponge that has absorbed too much, and is now leaking all over your shoes. The book is set in 1799, when Japan had sealed itself off from the entire world under the so-called ‘Sakoku’ policy, which prevented any Japanese from leaving the country, and any outsiders from entering. Sealed off, that is, except for the small artificial island of Dejima, off the coast of Nagasaki. At this time Dejima was controlled by the Dutch who, under the remit of their East India Company (a deliberately created Eighteenth Century trading monopoly), enjoyed exclusive rights to commerce with the Japanese. At Dejima arrives Jacob de Zoet; a young Dutch clerk on a five-year posting, during which he hopes to make his fortune and then return to Holland, having elevated himself enough to win the hand of his beloved and placate the suspicions of her father. 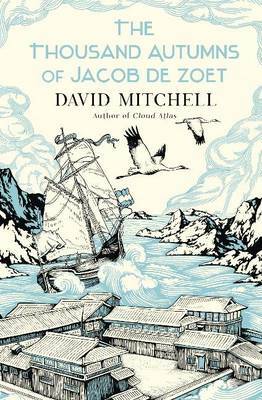 But, of course, Mitchell’s hero can’t have anything so simply; for Dejima proves to be a hot-bed of economic corruption, and from the moment de Zoet arrives, he is embattled in a long, drawn-out arm wrestle against the immoral vices of temptation, who are desperate to crumple his ethical and religious integrity with offers of easy money, easy women and easy power. But de Zoet’s torments aren’t exclusively professional. He meets and falls for a young Japanese scholar called Orito Aibagawa, whose face is half-disfigured (that is, if a face can be said to be ‘half’ disfigured) with burn scars. Jacob de Zoet, in his charming innocence, views her with an arresting combination of squeamishness and lust; Orito hides her scars out of propriety and shame, but de Zoet considers this covering-up to be tantalising; he stares at her covered face with an almost sexual indecency, as if Orito’s head-scarf contains not the disfigurements of past atrocities, but her actual sexual organs. Orito’s burns, for de Zoet, are symbols of her sexuality: hidden from view and delicate, something lewd yet off limits; how can he not view it as indecent; how, even, can he not view it as sexual? Yet despite these moments of appealing depth and originality, too much of this central relationship is overly familiar and, dare I say it, predictable. The young, idealistic man in a strange land who falls for the exotic yet forbidden foreign beauty is such a cliché of romantic fiction that I was surprised to find it in a book by David Mitchell. Thankfully, the resolution of this relationship isn’t nearly as trite as its conception. But a derivative characterology is one of the novel’s most striking shortcomings. We have Uzaemon Ogawa; the warrior-academic with an acute sense of ‘honour’, and love rival to de Zoet. Then there’s English naval officer Captain Penhaligon; a well-spoken yet ballsy old sea-dog in the mould of Jack Aubrey. And not forgetting Enomoto; a powerful political leader who’s secretly a religious nut-job. All characters serve their purpose adequately, but these three in particular seem, to me, to be plucked straight from the pages of ‘the beginner’s guide to historical fiction – unambitious edition’. However, the novel’s supporting cast held my interest and my thoughts for far longer than its central protagonists. I was particularly taken by Dr Marinus; a sarcastic and somewhat cantankerous Dutch physician who is nonetheless highly liberal, wise and devoted. I also liked Shiroyama; a Japanese magistrate whose loyalties are torn between political traditionalism and more Western modes of Capitalist thought. If the nuanced and idiosyncratic presentation of these minor characters could have been extended to the book’s top-of-list dramatis personae, the novel would, I feel, be significantly more accomplished. There’s also a monkey called William who runs around Dejima carrying a severed human leg. It’s David Mitchell’s treatment of history that is The Thousand Autumns… most accomplished and impressive characteristic. If I’ve not made it explicit already, allow me to do so now: this is a very complicated novel. There are hundreds of speaking parts, tens of nationalities present, and the political, emotional and economic machinations of the plot are fearlessly intricate. For history isn’t a neatly-cut puzzle of well-fitting sources that, once slotted tidily into place, creates a visionary and lush landscape of the past. History is bad mannered. It interrupts when you’re speaking and stamps on your half-finished jigsaw of interpretation with glee. Every page of The Thousand Autumns… introduces new conflicts, new complexities and wrenches your heart in previously unforeseen directions. Unlike most historical fiction, The Thousand Autumns… doesn’t take you by the hand and lead you gently through the green remembered gardens of a rose-tinted idyll. Instead it pushes you head-first into the fray of a newly-forging world, and expects you to find your own way out, or fight your own way out. I finished the book confused and dizzy, but invigorated. With every chapter my allegiances changed, and at the end I didn’t know whether I sided with the Dutch, the Japanese or the English. Mitchell’s characters may be a tad predictable and derivative, but his research, ambition and tireless devotion to representing the complexities of history are insurmountable. Beneath his glaze of sweat he sweats. Jacob’s fear is the size of a new internal organ, between his heart and his liver. The Thousand Autumns of Jacob de Zoet is an accomplished if imperfect epic. Parts of the novel are masterful, and it’s a testament to Mitchell’s dedication and constructional skill that long scenes in which ten Dutch diplomats speak through six Japanese interpreters to rooms full of foreign dignitaries are never over-complicated or difficult to read. Before I finish, I have decided that I do want to add my voice to those of the myriad protesters who are rightfully astounded that The Thousand Autumns… wasn’t shortlisted for this year’s Booker prize. I don’t think it’s an obvious and clear-cut deserving winner (my vote still lies with ‘C’ by Tom McCarthy), but it’s more than worthy of a place on the shortlist, and I’d even place it within the best 3 of this year’s nominees. I have taken time to describe some of its shortcomings; but I hope it’s clear that these are minor and forgivable in the face of the novel’s grander achievement; that of revealing what is possible in the medium of historical fiction. Maybe David Mitchell will never win the Booker; it wouldn’t be the first time that genre-defining art hasn’t been recognised by a major institution, but maybe this just doesn’t matter. After all, Radiohead haven’t won the Mercury Music Prize – and it’s not done them any harm. This entry was posted in Novels, Reviews and tagged Booker Prize 2010, David Mitchell, The Thousand Autumns of Jacob de Zoet. Bookmark the permalink. As usual an excellent review. Your introduction is wonderfully written and also spot on. I completely agree that simply because Mitchell’s previous body of work has been overlooked does not entitle him to greater consideration this time round; the decision must be based on the individual novel alone as you say. I happen to think this is the weakest of his books, despite agreeing with you that it is masterful at times in demonstrating the possibilities of historical fiction I also agree that it suffers from some predictable characters and an over saturation of research that bogs down his usually distinctive style. Keep up the good work, I find your blog incredibly interesting and it is always well written. Your opinions are also accurate and well supported and I shall be reading C by Tom McCarthy and The Unbearable Lightness of Being soon on the basis of your praise for them. Many thanks for your kind words, and for taking the time to comment in such detail. To be honest, I didn’t expect anybody to read such a long review, and I try not to post anything over 1500 words, but ‘The Thousand Autumns…’ isn’t an easy book to write briefly about. I’m still finding my feet and my style as a review writer, so I’m grateful for your encouragement (especially as I’ve received some less-than-favourable comments on some of my other reviews). ‘C’ is very good; it’d be a pretty out-there winner of the Booker Prize; but such prizes are always most interesting when they shake things up a bit. … Now my intended comment that I wish I’d written, “a bit like Jesus; immaculately conceived, but sloppily executed”, seems somewhat juvenile. I wrestled for the longest time over whether or not to include that. But in the end I came to the conclusion that it was too good not to. Great post. It’s funny, isn’ t it, how we try to squeeze our favourite authors into a prize-category winner when we feel they just deserve something. A bit like those Oscars that finally go to someone after 25 years of being hard done by. I like the Jesus comment too. Mitchell should have won for Cloud Atlas, and that he didn’t get it for that suggested to me, earlier this year, that he would be given it for Jacob De Zoet. He will win the award eventually, as he seems incapable of writing a bad book and by sheer diligence the accumulation of his novels should provide too big a factor to ignore. Mind you, Philip Roth may never get the Nobel. But I’d put a sizable wodge down right now on Mitchell getting the Booker before 2025. I actually think that the prize should ignore the cummulative quality of his novels; the Booker isn’t a prize for a body of work, but for an individual novel, irrespective of previous failures of success. I agree, but that’s how it seems to play out. Future panels may – as they have done in the past, William Golding being a notable example – make amends for past slights. You’d hope not, of course. And if we’re talking about the best novel this year, it’s easily Damon Galgut’s book, although Jacobson and McCarthy are well worth a mention.